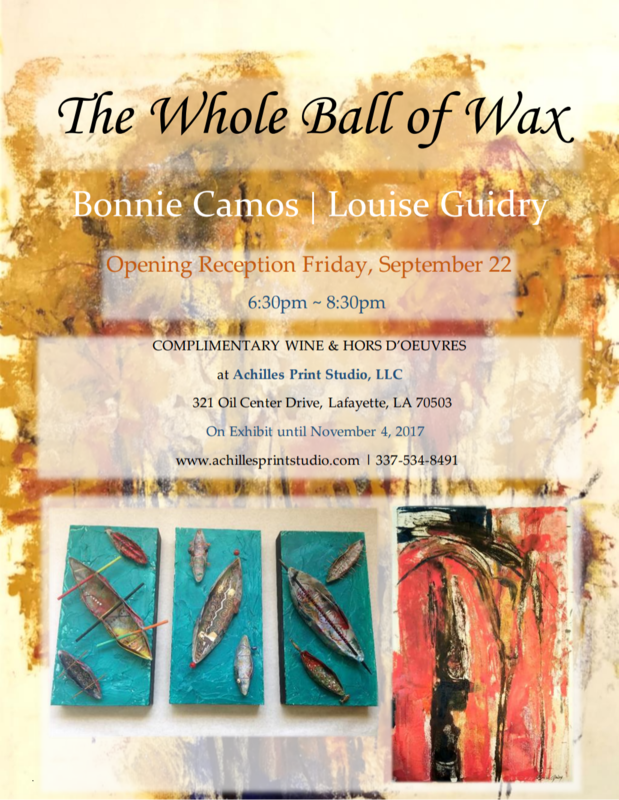 ​Join us for the opening reception for artists, Bonnie Camos and Louise Guidry at Achilles Print Studio on Friday, September 22 from 6:30pm-8:30pm. 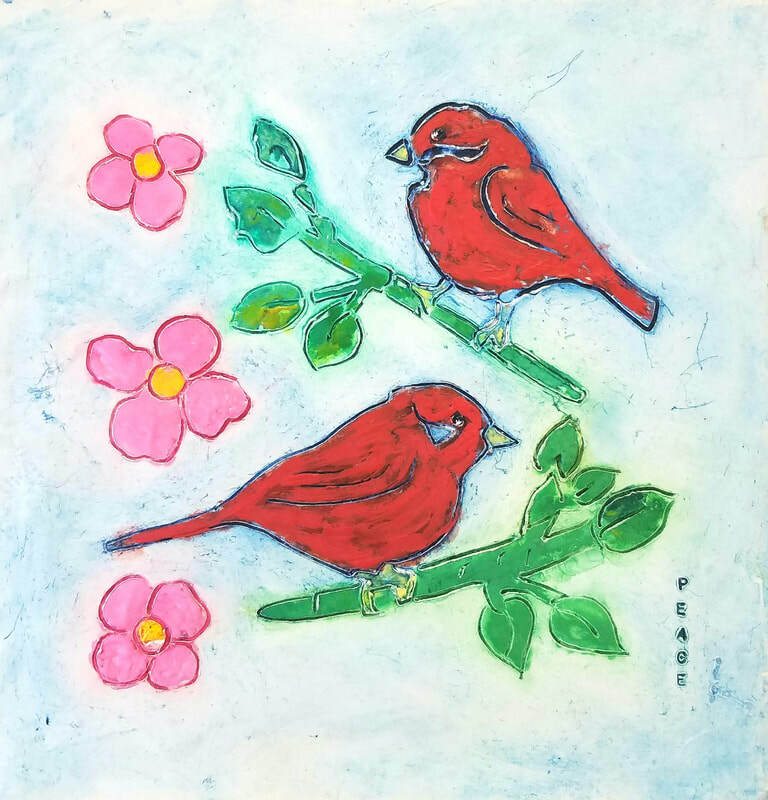 On exhibit, recent works consisting of encaustic paintings and three-dimensional wax pieces. There will also be a demonstration of working with wax! Hors d'oeuvres & wine will be provided. We hope to see you all there. Cheers! Louise Guidry was born in Ville Platte, Louisiana, a very small southern town, Louise didn't have any formal art training as a child, but her mother was a seamstress, and Louise was intrigued by the scraps of fabric and threads that her mother would discard and she would play with them. For Louise, this was her first attempt at creativity during childhood. 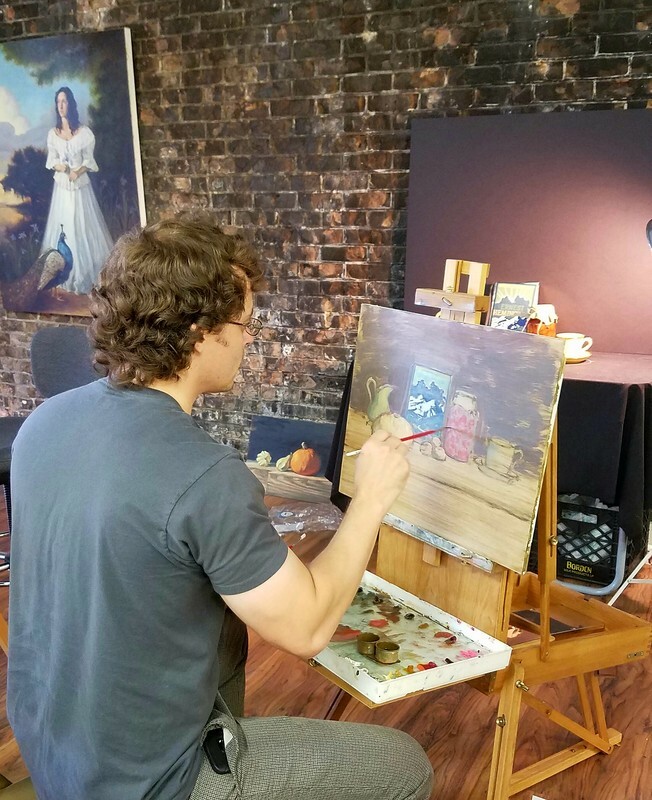 It wasn't until Louise and her family moved to St. Martinville during high school that she started studying art independently, and later on at the age of thirty she began to paint in earnest. ​Louise married, had children and was very occupied with family life and an elementary school teaching career, but once her children were grown up she went to study at the University of Louisiana at Lafayette at age 54 and received her Bachelor of Fine Arts degree at the age of 58. 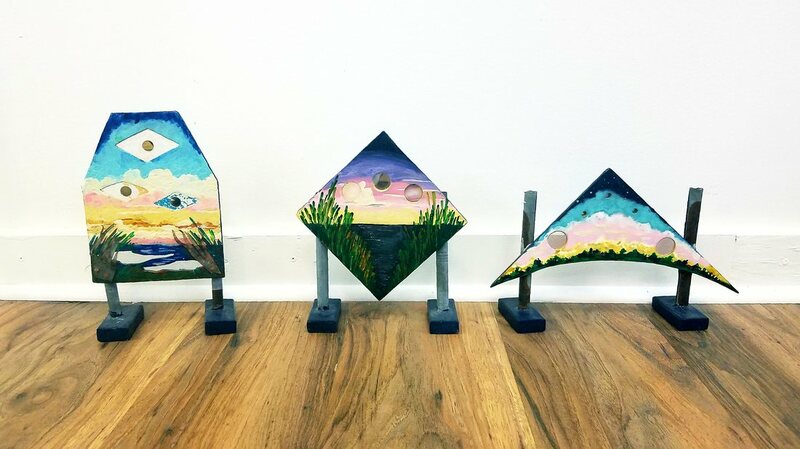 Louise has been making artwork ever since and now her paintings are accepted around the world. Bonnie Camos was born in (Clonfert) County Roscommon, Ireland and currently resides in Lafayette, Louisiana since 1957. She received her Bachelor of Fine Arts degree in Visual Arts: Painting at the University of Louisiana at Lafayette. Bonnie began making artwork at the age of four and having ten siblings in her family, there was not shortage of subject matter to draw form. 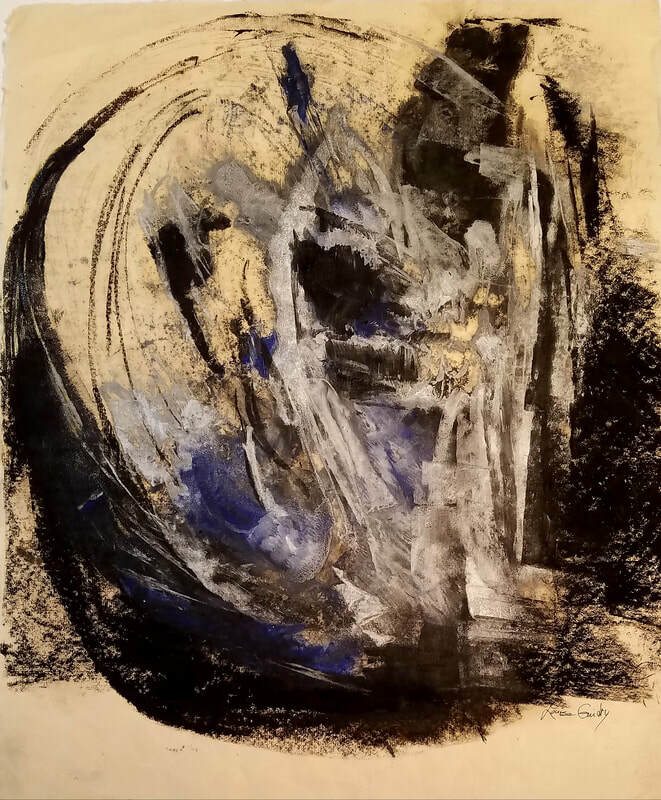 Her interest in mixed media work using oils, encaustic, paper making, acrylics, and found objects arose of years of experimentation. The spontaneity of the wax medium combined with the richness of the colors became a primary force in the creation of the artist latest work. The inspiration for my work is based on color and the impact it has on human emotion. Using the mediums of encaustic, oil pigment in beeswax and resin with heat, I explore the possibility of color relationships. By reducing the figure or face to the most simplistic shapes representing a universal "picture" of a man. I mean to suggest the connection we all have to each other through our life experiences and the emotions elicited from these experiences. ​through printmaking, art classes, workshops, lectures, and gallery space. ​﻿"Way to go, Jessica! Jessica Moore is a very talented artist and instructor. 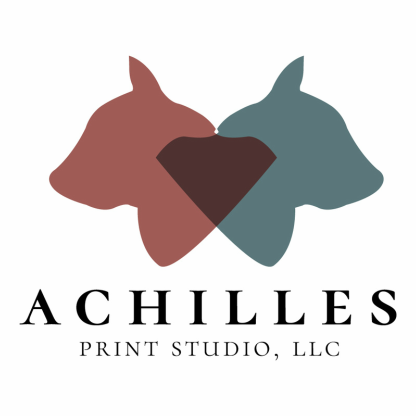 If you are interested in taking some classes in printmaking, look no further than the Achilles Print Studio." "Best art school in town! I am an instructor at Achilles and I very much enjoy the emphasis on fundamentals and technical information that can later be translated into any style"
"This studio is a long overdue concept brought to reality by a wonderful artist and dedicated young lady." "Hi Jessica, Thank you for the considerate and professional handling of the workshop. It was a pleasure to study in your studio. Thank you." "Really enjoyed the George Loli watercolor workshop. Great artist. And great hospitality by Achilles print studio!" "Great writing class with Leigh Rourks!" "I'm so proud of her studio!" "Jeromy is a great art teacher. I'm so blessed to have taken classes from him." "Amazing teacher!!!! Sign up for one of his classes. You will be so glad you did!! Thanks Jeromy!" "​Y'all this is an incredible studio!!! I take oil lessons from Jeromy... one of the BEST teachers I have had in my 10 years of painting... just signed my 7 year old granddaughter up for watercolor class with George Loli... my son took from a George in college at UL and said he is amazing. If you are even considering lessons for yourself or your child here do it!! You will be sooooo glad you did!" By following us and subscribing your email, you'll be updated with upcoming art classes, creative workshops, exhibitions, and lectures. We will also update you with special promotions. 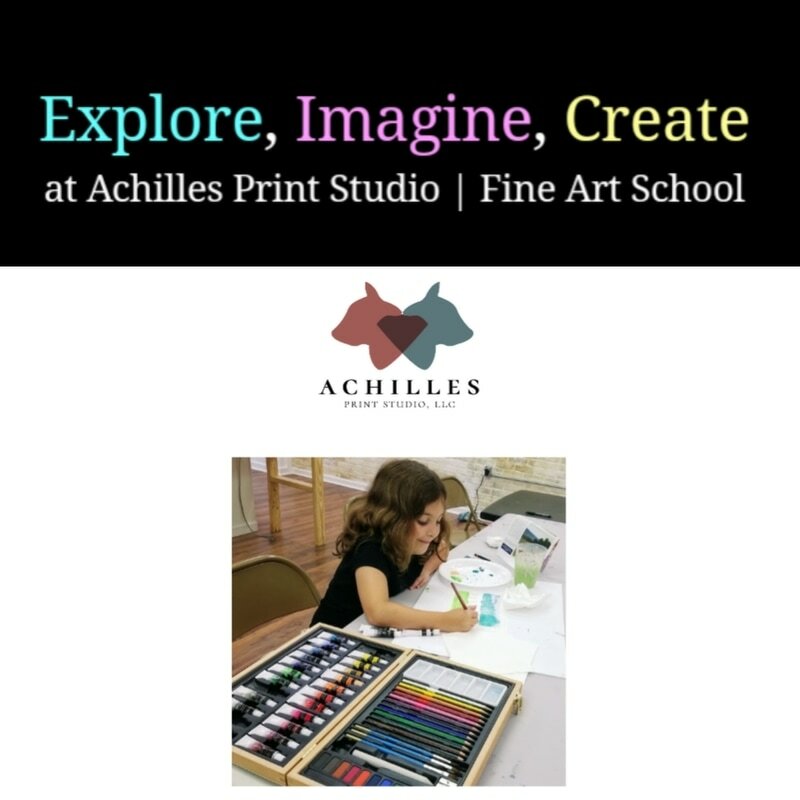 ​Achilles Print Studio is a Fine Art School & Gallery offering art classes, workshops, and lectures in multiple genres, such as printmaking, drawing, painting, and creative writing. We offer classes for all age groups and skill levels. Our mission is to foster arts education and creativity in Acadiana, by providing opportunities and resources for artists and writers to help enrich the community. We offer art classes and creative workshops every month as well as host exhibitions and lectures throughout the year. Our classes are taught by professional artists and writers who are experienced instructors. We strive for excellence in the arts and education here at Achilles. Please see our upcoming classes for more information about our instructors and class offerings. Thank you for your wonderful support from all of us at Achilles!